In the new movie "The Martian," due out in October, Matt Damon plays astronaut Mark Watney, who is mistaken for dead and left behind on the Red Planet. NASA and Watney's crewmates must decide if they should rescue him. An epic new trailer for the movie "The Martian" looks even more intense than the last one, and it raises some intriguing questions about the value of human life in space exploration. Set to the howling Jimi Hendrix song "All Along the Watchtower," the new trailer for "The Martian," directed by Ridley Scott, features some thrilling (and stressful) clips of astronauts braving Martian storms, rocket launches and other near-death experiences. 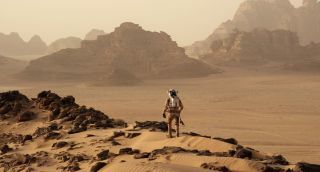 The film focuses on astronaut Mark Watney (played by Matt Damon), who is mistakenly presumed dead by his fellow Mars explorers and is left behind on the Red Planet. In an earlier trailer, Watney makes clear that he understands the risks of space exploration, saying, "It's space. It doesn't cooperate. I guarantee you that at some point, everything's going to go south on you. And you're going to say, 'This is it. This is how I end.'" In the new trailer, we hear the end of that quote, in which Watney goes on to say, "Now, you can either accept that, or you can get to work." Stranded on Mars with only enough food and water to last 50 days, Watney must wait four years for a rescue mission to arrive. As a result, he's forced to find a way to grow food on a lifeless planet, and produce water. Other threats to his life and his safety arise, and he proclaims at the end, "No matter what happens, tell the world, tell my family, that I never stopped fighting to make it home." Meanwhile, NASA and Watney's crewmates must decide whether to rescue "the Martian." By sending the crew back to the Red Planet, the agency would be risking six lives to save one, and thus rejects the proposal. The crewmembers must then decide whether they will not only risk their lives, but declare mutiny by going against NASA's orders. In the new movie "The Martian," a group of astronauts must decide if they should rescue their stranded crewmate from the surface of Mars. The plot of the film is a thought experiment: If a person understands the risks of space exploration, should the rest of humanity make every possible effort to save that person if (or when) things go wrong? Is NASA's responsibility different from the individual responsibilities of its astronauts? These are questions that humanity will have to seriously consider if a program like Mars One gets off the ground: If a private company sends people to space and something goes wrong, how much money and effort should the rest of the world spend to save them? Is it directly comparable to instances where hikers become lost or stranded, setting off costly and risky rescue missions? What do we lose if we reduce the value of one human life compared to multiple lives, and what do we lose if we don't? We're excited to see how the movie tackles this question, and how closely it will follow the book by Andy Weir on which the movie is based. The film is set to be released Oct. 2 and, in addition to Damon and Daniels, stars Jessica Chastain, Kristen Wiig, Kate Mara, Michael Peña, Chiwetel Ejiofor and Donald Glover.